Part of the reason that I *have* clients is because it’s way more cost effective to hire me than to do this yourself. And because you’re a business owner like me, you’re barely carving out enough time to answer emails, never mind read and implement a 6,500 word guide to SEO for photographers. Let me make one thing really clear: I want you as a client. I’m not going to cold email you and charge you $99 like some scammer – I’m going to win you over by showing you exactly how I would rank your photography website. 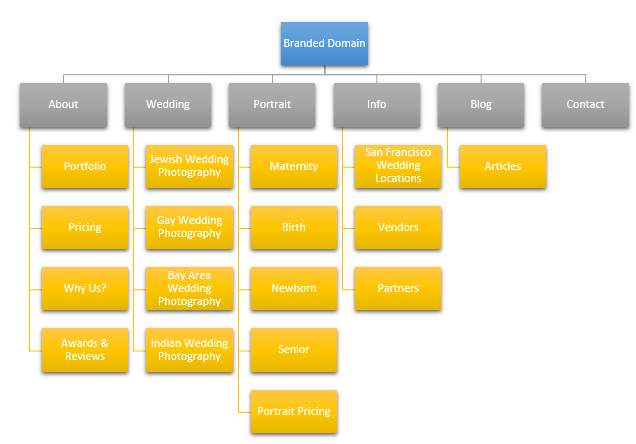 This is the exact blueprint that I’ve used to rank other photographer’s websites (like in this detailed case study). 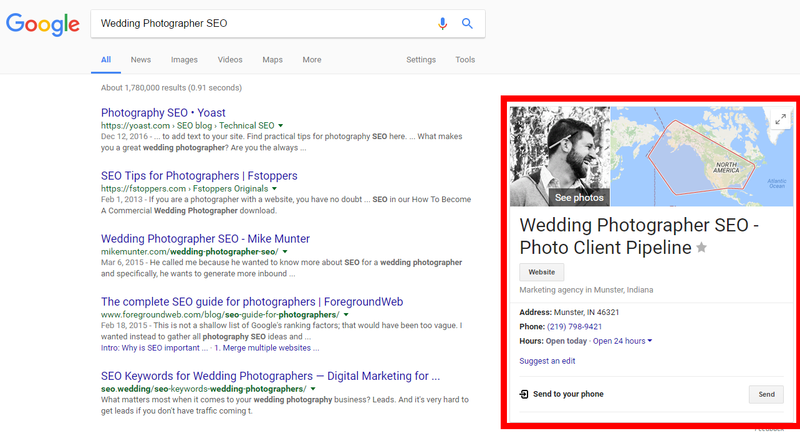 This post on SEO for photographers took over 20 hours to write. Why’d I spend that long writing it when I could’ve written something else? Because I want to help you the best way that I can. If that’s through information, awesome. If it’s you hiring me, that’s great too. I’ve learned from running (and selling) two successful online businesses, before starting Photo MBA, that the best way to prove something is not to tell somebody, but to show them. I’m not going to tell you I run the best SEO agency on the planet for photographers. This post is my sales pitch. You can either hire me or grab my course and learn all of this for yourself. If you’re the kind of photographer that’s just interested in results, click here, and then here. If you like to do your homework, read on! One quick distinction before we move on: When I say “website” in this article, I mean your business website like michaelwillphotography.com, not a portfolio site hosting on Zenfolio or Smugmug. This is my favorite thing about photography SEO. Unlike other marketing methods where you have no idea if you’re going to get your money back, I can track exactly how much money I make for my photography clients with great analytics. I set up a custom dashboard to track the work I do and I can show clients their exact return on investment. I prefer to use Google Analytics and Google Webmaster Tools because they’re the best. They don’t take long to set up and Google has created some great stuff to help you out. 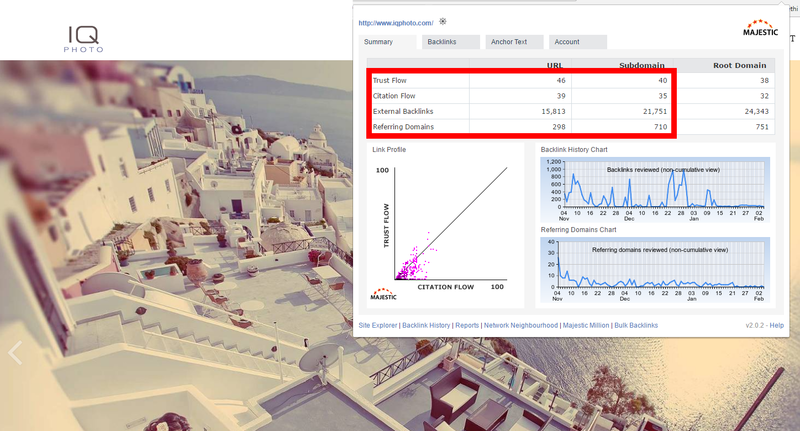 In your analytics, I set up a custom dashboard that puts everything we need to know on one screen, so here’s how to get all of that information for yourself. What it means: This will quickly tell you the number of people visiting your website and what kind of device they’re using to view your site. It also gives you a heads up on bounce rate (how often people ditch your site after looking at it), how long they’re viewing the site and your goal completion rate. If your organic traffic isn’t increasing over time, your SEO isn’t working. We end up here, being able to see how people are viewing your page AND the numbers coming from search (part of how I track ROI for SEO work). What it means: It shows you your “impressions” (how often you show up in Google – should be going up over time) and “queries” which are the keywords people are using to find you (it should match the keywords you’re targeting (but more on that later…). It verifies that the work you’re doing is working and shows your traffic is coming from the right keywords. To do that, you need to track your Goals. We’re going to use a “form submission” (when a site visitor completes your contact form) under the assumption that it then sends them to a “Thank You” page. What it means: You’ll quickly know the pages that are bringing in the most leads (goal completions). Each page on your site should be optimized for various keywords. By looking at how much traffic they’re bringing in and what the goal completion is, you’ll be able to see which ones hold the most value for you. Before now, you probably just got 10 contact form emails per month and thought it was nice. But did they come to your site from social media? From the ad you ran on Weddingwire? From that guest post you wrote or that featured wedding you had on The Knot? In the above screenshot, the photographer had 33 contact form submissions in the last 30 days. 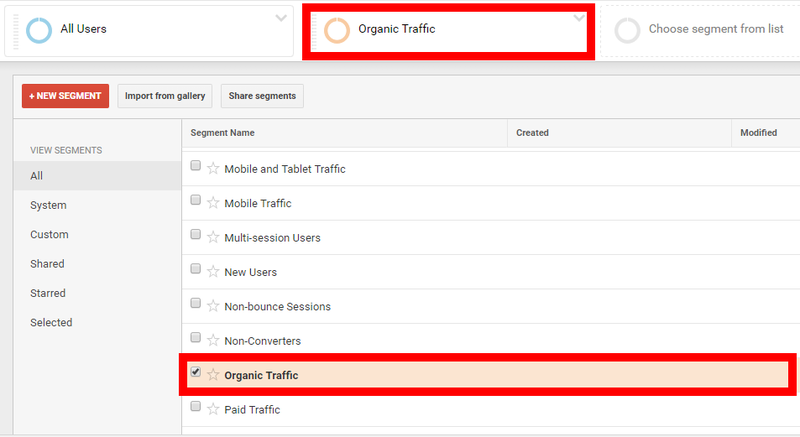 If we filter down to organic traffic, we can see that 21 of them came from organic with a 7.81% conversion rate (this makes me pumped, because last month it was at 7.14%). If we compare that to the overall traffic (which is higher), the conversion rate is 5.16%. People who found this photographer’s website by searching for it are much more likely to become a valid lead than those who don’t. This is yet another reason you need to focus on search. People trust their friends recommendations on social, but they also trust Google. Now you know exactly where they’re coming from and (a bit further down) you’ll know how to improve them to bring in even more. Most important, you’ll know exactly how well SEO is growing your business. Let’s use the image above and assume that I’m charging $1,000 per month for SEO. When you drop that into Google Sheets, you can see the photographer has over $5,000 in net profit this month, just from SEO (and after he’s paid me). Here’s the best part of all this (but wait, there’s more! ): By converting our goal completions plus our personal lead conversion, we can base the value of SEO just on traffic. By multiplying our on-site conversion with our leads -> clients conversion, we can just input website traffic and see how much our income will (likely) increase if we increase traffic. If we take the current traffic, we see a profit of $8,454 per month. Keyword research is like getting into the mind of your ideal client. Instead of writing about what we “think” they’re searching for, we know. Now we can control your traffic and leads (the thing that really matters). We’re not going to use this to run ads, but we are going to look at it because it’s free. It’s just as good for this use as all of the expensive tools that I use to run my agency so for you, it’s perfect. Log in with Gmail, click Tools > Keyword Planner and input the keywords that you brainstormed in part one. On the next screen, you’ll see a “Keyword Ideas” tab and how many searches each gets per month. Don’t worry about the competition or suggested big (we aren’t running ads so these don’t matter). Click “download” to get them in Excel format. Delete all columns EXCEPT B and E (this means delete A, C, D, F, G, H, and I). You can highlight them all and right click ‘Delete’ or do them one at a time. Then, highlight the first row, right-click > Filter > Cell Value. 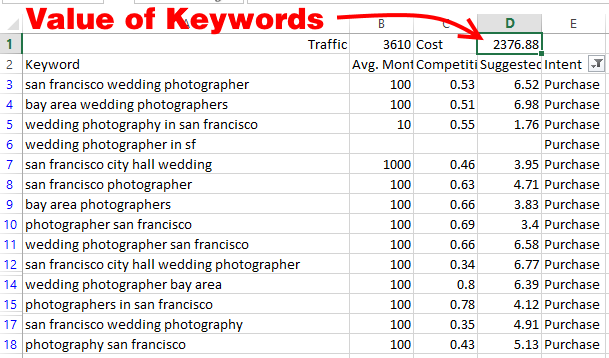 You don’t have time (neither do I) to go through 500+ results from the Keyword tool. Let’s find the most relevant ones. While both of these keywords would be great to rank for, one is somebody looking for information and the other is somebody looking for somebody to hire. 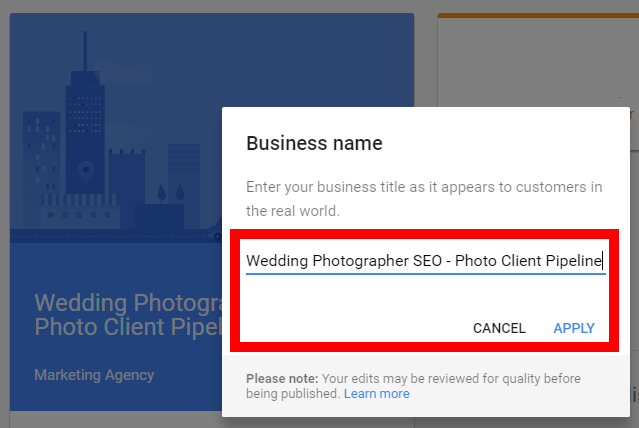 We want to separate keywords that bring in random traffic from the keywords that bring in people looking to hire a photographer. You’d rather have 500 visitors a month for people looking to hire you versus 1,000 looking for the best wedding venues in your city. 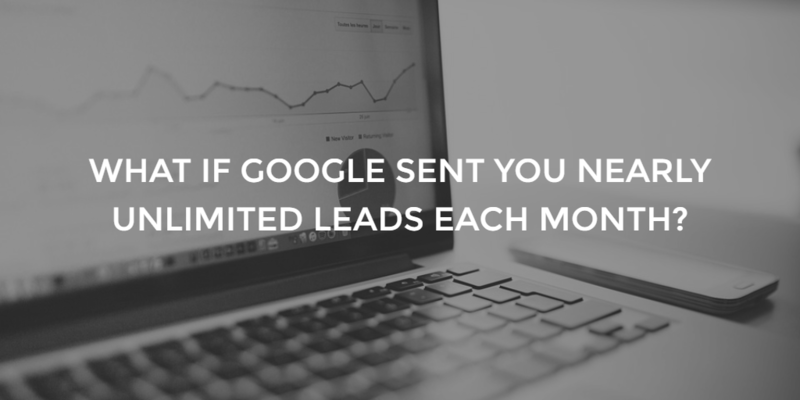 We don’t just want traffic.We want traffic that brings in LEADS. 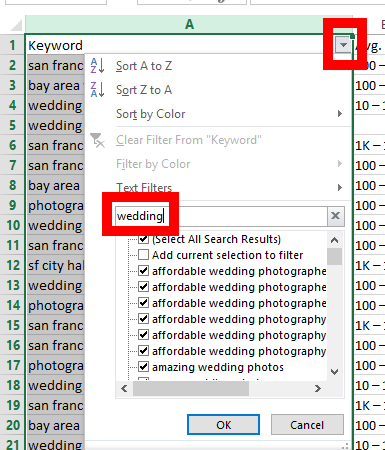 The best way to do this is to add another column in your excel file called “Intent” where you’ll decide whether the search term is for “Info” or “Purchase”. Sort your search volume column from high to low. The keyword with the highest volume is going to be your main keyword. 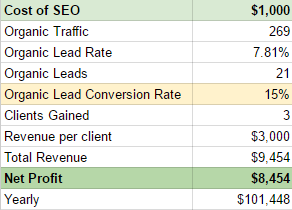 Here’s a basic analysis of SEO competition: It’s roughly equal to how much a potential client is worth. 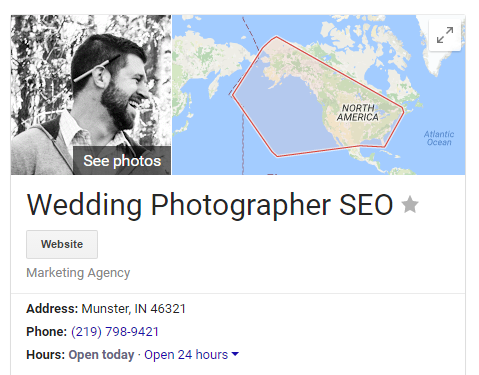 This means that photography SEO is way less competitive than attorney SEO, but infinitely more competitive than coffee shop SEO. Cost of service + online demand = LOTS of Competition. It’s insanely difficult to rank an attorney website because any law firm with two brain cells has been investing in SEO since the early 2000s. What’s awesome for you is that just by reading this guide, you’re in the top 50%. I feel pretty strongly that hiring me puts you in the top 5%, for comparison. I know because I’ve looked at hundreds of photographer’s websites, backlink profiles, etc. and I can tell you first hand that most of them have no idea what they’re doing with regard to SEO. But, if you want to rank better, you have to be better. Being better means knowing what the competition is doing and how you stack up. There are a lot of fantastic free tools out there, but my favorites are the Moz and Majestic browser plugins. Moz requires a quick, free signup but after that you’re off to the races. How many websites are linking to the root domain (like PhotoMBA.net). This is known as the Domain Authority (DA). The higher that these two numbers are, the more Google likes that page (and the harder it’ll be to outrank). The “quality” of the links (how related they are) pointing to a site, known as Trust Flow (TF). The “power” of the links (how big of a site they’re from) pointing to a site, known as Citation Flow (CF). The type of text that other pages use to link to the site, known as Anchor Text Ratio. If it’s really varied, this means it’s probably natural, making it hard to outrank that website. We aren’t going to worry about the rest of this stuff. It’s already confusing enough as it is and this is what I do. Look at the anchor text. Does it look spammy (100 links all with the exact same text)? Ready to move? Let’s get after it. I am a total fanboy of Google Sheets and keep everything that I do for my clients in there. I think you should use them, too. 1. Search by typing your main keyword into Google. 3. Click the Majestic browser extension. *Note, the numbers above differ from those below. For my clients, I use paid tools like SEMRush and Ahrefs. I am using free tools for the purpose of this guide, but when my clients are trusting me with their online reputation and paying me, I make sure I’m using the best tools possible. 4. Update your spreadsheet with TF and CF. Make sure you’re using the URL metrics. Even though all three of these links go to the same place, the anchor text is different, and in Google’s eyes, that matters. If you know about SEO three years ago, you remember that anchor text mattered a LOT and simply by spamming the web with the same anchor text over and over, you could rank for that keyword. But Google is a billion dollar company. So, of course, they figured that out. What? You thought they wouldn’t? Spamming like that is a great way to get your website penalized. Sadly, that’s what a lot of these $99/mo SEO joints from overseas are still doing. If one of the sites you’re competing against has a profile like that, make sure to note it. They aren’t unbeatable by any means, but they’ll be a bit trickier because they know what they’re doing, too! Finally, we’re going to dive into the most important part of investigating our competition: backlinks. Backlinks are the most important factor in determining whether or not you are found in Google. This may mean the difference between getting 10-20 leads per month and living the high life or hustling for 3-4 leads per month and barely scraping by. The best backlink profiles will have links from the same niche. 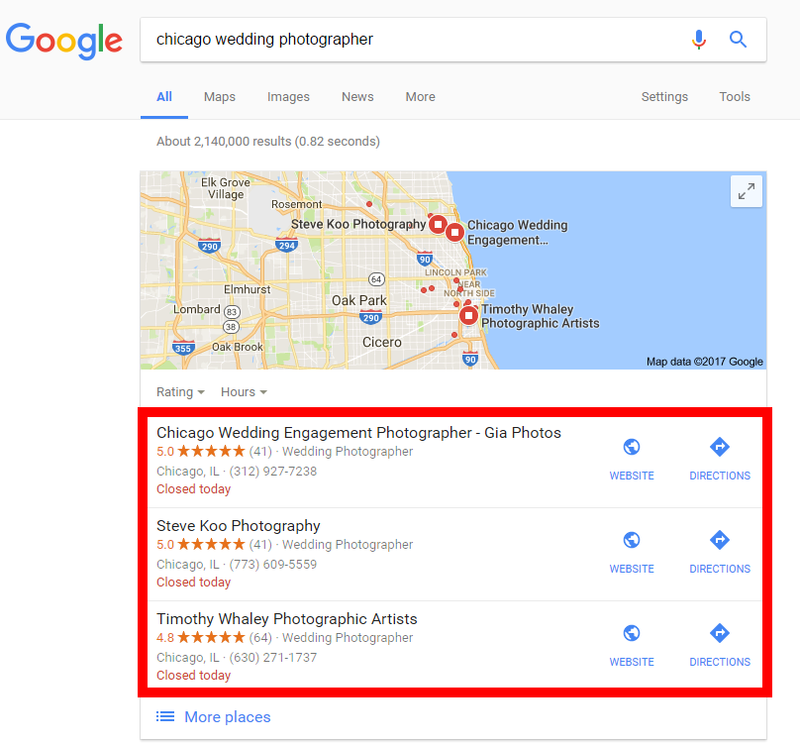 If you’re a wedding photographer in Chicago, you’d have links from local sites, wedding sites, and photography sites. 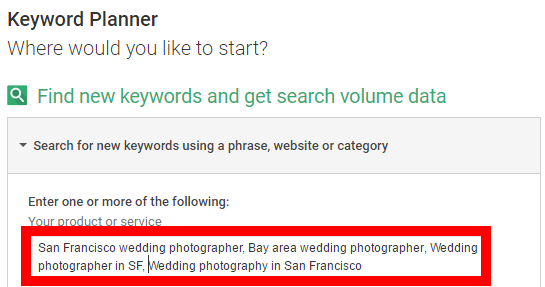 It looks strange to Google when you’re a wedding photographer with links from baking sites, gaming sites, and horse racing sites, right? Right. One of the things we’re looking for here is link opportunities. If Google likes that they have these links, they’ll like us to have them, too. Click the links to see where they’re at. Did they get mentioned in a blog post? Can you advertise on the site they got a link from and get a sponsored post? Save the contact info from the website in your spreadsheet. You’ll want to get in touch with them when it’s time for you to build your own links. You’re looking at this thinking, “GEEZ, this is a lot of work.” NOW you’re getting why good SEOs, like me, charge so much for our services. The top spot is built on a brand name, not an exact match domain (EMD). This means that we don’t need an EMD, either. The top spots have a lot a lot of links. In some niches, a few really powerful links are better and in others, a lot of lower-tier links are better. In this niche powerful links matter way more than volume. There are still a few EMDs ranking on the first page. I’d consider looking at how old those are and possibly building one myself. With all of this said, I’d estimate that it’s going to take at least 3-5 months of dedicated work to see us ranking in the competitive “Top 5” on that first page. There are two ways to build the biggest building in town: 1. Build the biggest building in town. 2. Tear down all the other buildings around you. Google values user experience on your website. And if you want to start closing more visitors and turning them into leads, this means that you need to have a site that’s super easy to use. 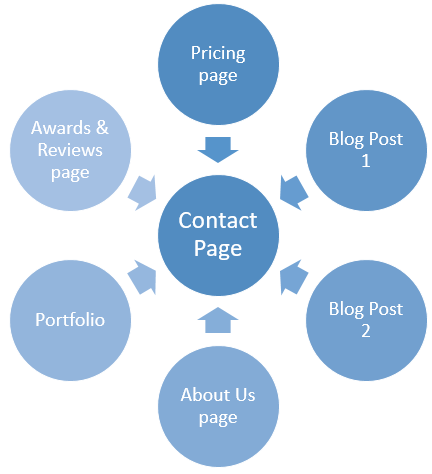 We accomplish this by focusing on the navigation and grouping content. 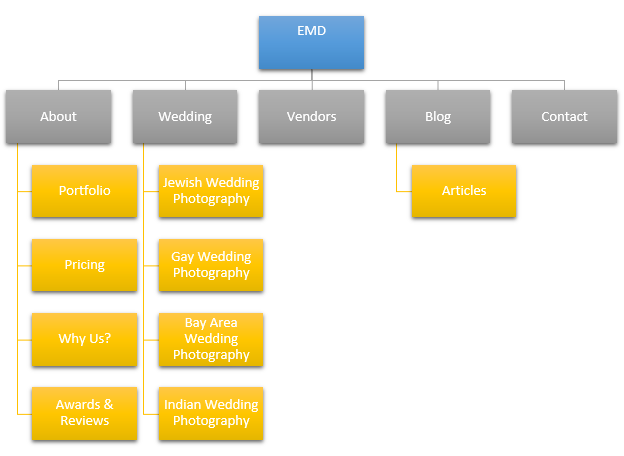 Add pages to your site that expand on your niche: sfweddingphotographers.com/wedding-photography or /northside-wedding-photography or jewish-wedding-photography, etc. The more service pages, the more you can rank in additional niches within your niche. Another essential tip for getting more leads out of your website. Use your brand as the domain name. Nobody is going to book a senior portrait from chicagoweddingphotographers.com and nobody is going to book a wedding from chicagonewbornphotography.com, either. Not only does it make it confusing for visitors, but also for Google. If your domain name says you do one thing and a page says another, it’s confusing for them as they crawl your site (chicagoweddingphotographers.com/senior-portrait-photography is just confusing and generally terrible). Add a service page for each service you offer. This is how my clients are able to rank for 10 different services with the same website. 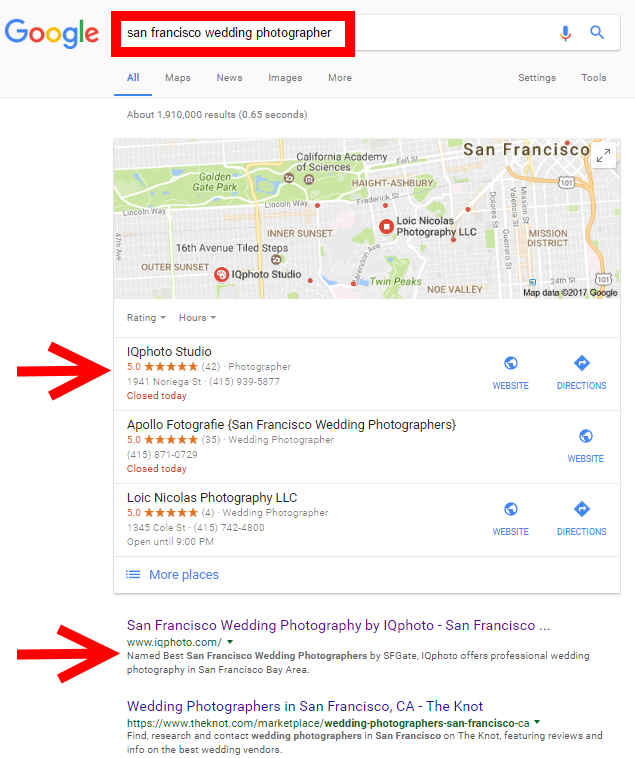 For the most part “local” SEO isn’t any different than general SEO discussed elsewhere in this guide, however, there are a few key things we need to pay attention to since we want to rank for something locally: Google+, Reviews, and Citations. Those titles that you see there are from their Google + pages, not their websites. For that reason alone, you should be paying attention to your G+ page. This isn’t a super fast process because Google sends you a postcard in the mail to your address with a verification code. You enter that into your page and then, only then, does it appear is local search and map searches. They’re serious about people lying (read: scammy SEO companies lying) about where they’re located just to get more traffic. 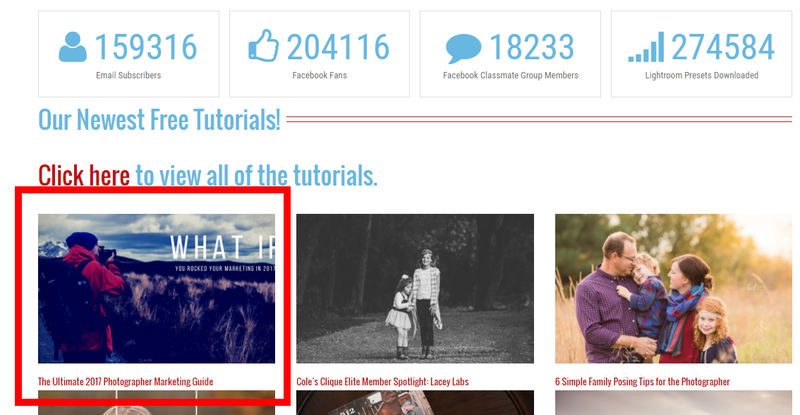 Once you’ve received your post card, click on the big red button and edit your page. And that work, nets you this: An image and feature that’s as big as the Top 5 searches for my main keyword. Worth it? I think so. Edit the description of your page with roughly 200 words about your photography and link directly to those services pages. You can also use ‘canned’ email from gmail to send these out automatically if you still haven’t gotten your mailing list together (TIP: Get that together. You’re leaving thousands of $s on the table every year without one). Send direct links to your pages on Yelp, Foursquare and any place else you want a review and ask them to pick one to review you on. Local directories are things that list businesses and their websites like Yellowpages, Yelp, Foursquare, etc. There are over 250 directories. How many are you listed in? These not only provide great backlinks to your site, but also tell Google that you are a legit business that cares about its online reputation, thus they should care enough to show you to searchers. I almost went numb doing these for my own business, but it was worth it. It’s why I built an amazing team and we can tag team tasks like this to get it done for clients. Your success in search, in SEO, is based on your ability to create awesome content and get it shared. Let’s be clear about something: SO many people are confused about this point. Brendan, do I make daily content? Do I make content on social? On my blog? Do I make longer content? Shorter? How many words, Brendan? HELP! And here’s what ends up happening: Photographers make thin and pointless blog content every day for a year and have no idea why they aren’t getting clients from their website. If you’re searching for anything online, the most important thing that will drive your purchase decision is your content. Specifically, WRITING. Do you think I enjoyed spending 20+ hours writing this article? I have two strapping young sons and a brilliant wife. I like to lift weights and run hills. I’m obsessed with the outdoors. I don’t make content not worth making. I would never waste my time on thin content just because “content is king” or whatever the buzzword is now. Every single blog post on my site has keywords attached to it. So do my clients. So should yours. Go back to your list of keywords you put together earlier and separate them into “purchase” intent keywords and “info” intent keywords. Purchase intent is that they are searching online for somebody to hire. “Chicago wedding photographers” has purchase intent. Information or “info” intent means they’re just trying to learn more about something related to the work that you do. “Best wedding venues in Chicago” is informational intent. They BOTH matter. Obviously, purchase matters because you want people to hire you, right? However, too many photographers stop there or they use their blog to write articles like it’s still 2002, giving you personal updates you don’t care about. Informational articles matter because they’re the things that get your blog shared and linked to from other websites. Nobody wants to link to your pitch page or landing page. Nobody wants to share your contact page on Facebook. Nobody. But they do want to share your “Ten Most Jaw Dropping Chicago Wedding Venues” post and when they do, boom, brides are on your site. What what about other types of content? Isn’t that what “content marketing” is all about? Absolutely. That’s what we refer to as “Information Intent Keywords” (“Info” keywords, for short). I’m going to be a bit meta about this here, but that’s why I’m writing this article. Sure, I could just target keywords like “how to hire SEO” and things like that, but I want to REALLY get Google’s attention. I need articles worth linking to (like this), shares on Twitter and Facebook, etc. The only time somebody shares your homepage online is when they’re making a post to tell their friends to check you out. Odds are, this is a current or past client who was in the mood to share. This happens almost NEVER, so we need to make something worth sharing. Additionally, real websites have links that go to the homepage, sure, but also to every other page on the website, especially their blog posts. “Information” posts are what gets you the links and shares. That’s why you absolutely must be blogging. 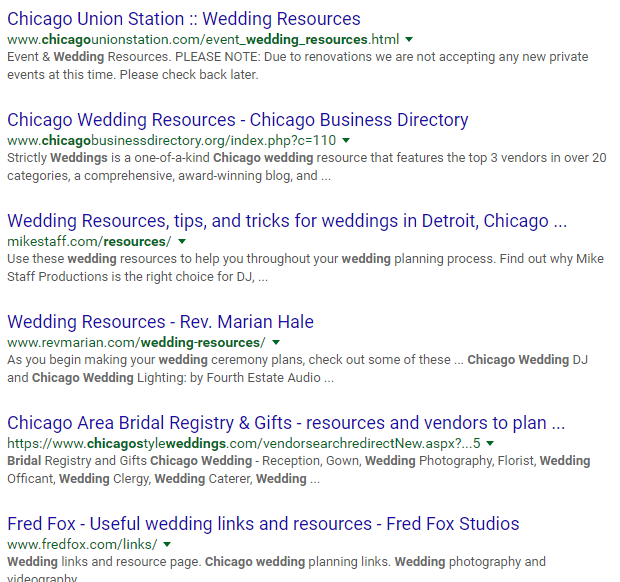 Looking back at the “informational” keywords that I wrote down earlier, keywords like “best wedding venue Chicago” and “cheap wedding Chicago” generate a good amount of monthly searches. Thus, we build articles around those keywords. It’s easy to write the article, but a whole lot harder to get people to care about it. Your writing in these posts is going to build the trust that makes a bride book you at $4000+ for their wedding. Don’t look cheap in your writing. The better they are, the more shares / pins / links and traffic they’ll get. No matter how much Google changes it’s algorithm (another reason you should hire a pro to handle your SEO), the number one factor to getting ranked is the number of links that point to your website. When I built my first blog over a decade ago, I could write 500 words, click a few buttons, and BAM, we’d be on the first few spots in Google. Photography is a competitive industry, especially with no many newbies jumping into the pool. Google is only going to rank sites with some authority and trust behind them. Sponsoring blogs to support our content. This might seem like five little bullet points, but it’s a full time job. For three people. BUT, if you want to build a thriving photography business, you can follow my advice here and it WILL work. I guarantee it. Most people think this means posting from your branded page or personal pages / profiles. While this is correct, that’s really the kindergarten version of what I work on. You have to get your content into groups and into forums. People who pay for photography LOVE to share photos on social media. Even more, they LOVE sharing on social media. But don’t limit yourself to just your potential clients. Write something that resonates with your peers (like this) and they’ll share it with their audience, too! Reddit is probably the best known Q&A and link-sharing site in the world, but their community will eat you alive if you drop in there and start spamming. Quora, on the other hand, is amazing. You can drive thousands of visits month or month by answering questions there. But, photographer beware, you can also waste a TON of time answering questions with no ROI. So here’s what I do: I use the search operator “site:quora.com” followed by my keywords or question in Google and see what’s ranking in Google for those terms. Google does a great job of pulling the best from Quora. IF you took my advice earlier and wrote a guide about the 10 reasons to get married in your city, you can search in Google and go through each of the questions it pulls up. Write a short response (less than 500 words) with a link to your article at the end. You thought Google+ was dead? Not so. Think Google doesn’t care about all of the +1s that you get on Google+? Maybe not, but maybe so. Here’s how to find some communities. Join a few related to the type of photography that you do. 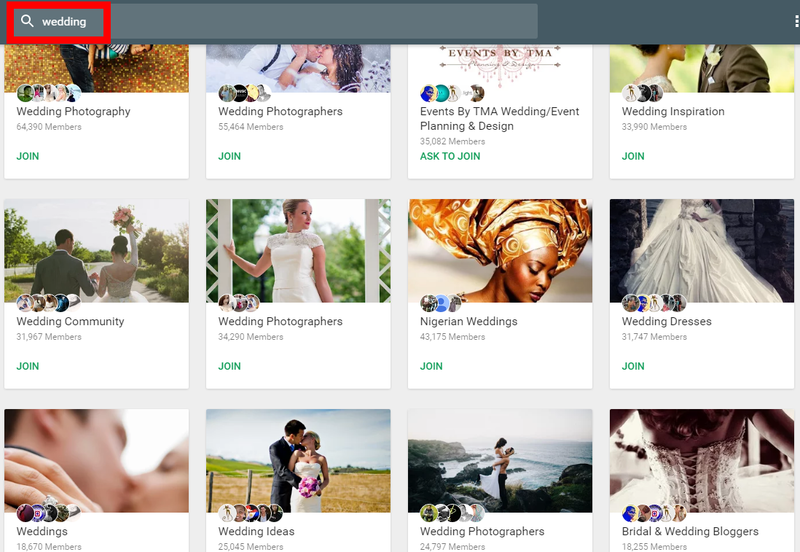 YES, you can join communities for photographers, but also focus on where your potential clients would hang out on Google+. Join a few and watch what they post there. Are they telling stories, or sharing links? After you’ve been hanging in there a few days, introduce yourself with, provide some great advice or help, and then drop a link to your best blog post. By jamming in Quora and Google + on a consistent basis (in addition to Twitter / Facebook), you’ll tell Google that you’re a real business with a real website. One worth ranking and sharing with searchers. When we link internally, we can pass along link juice from our blog posts to our pages that convert visitors into leads. We also send the traffic there so it’s a win/win. In the most simple terms possible: We want to drive traffic to our contact page to convert visitors to leads. This means, we need the other pages on our site to point to it. Emailing random websites begging them to link to you sounds stupid, right? Guest Posting is definitely my favorite kind of link building. You’re providing value to somebody else’s audience, as well as getting some traffic and a link from them in exchange. (Hate writing? Hire somebody to handle it for you. Dollar for dollar, it’s SO worth it). They have VERY high standards. Anybody worth writing for will, too. Read their posts and read through their guidelines before getting in touch. Here’s a guest post that I recently had published on Cole’s Classroom. Much like this post, I spent over 15 hours on it, but we’re not just building links with these kind of posts. Drop them a note about your content and what you think would be really helpful to their readers to have included in their resources list. Okay, so we’re not really stealing here. It’s not like we’re Bill Belichick videotaping his opponent’s coaching signals for later use. We’re not taking anything away from them, but instead getting a sneak peek at their playbook and play calling. If you can find out who is linking to your competitors and then get those same links, you can eliminate their entire advantage. Then, in my experience, all you need is a few more links to outrank them. BAM. You now have their entire playbook. You’ll see blog comments, guest posts, resource pages, link roundups and a few other things here and there. Think about it: Google is already telling you they love these links. If you get them, they’ll love you, too. Back in the day, it was a big move to send out a “press release” in the hopes that people would see it and write about you. In fact, SEO agencies that are still a few years behind the times think that they still matter. I’m a entrepreneur, but my first business was a blog that made money from ads. Local news media makes money from subscriptions, but most from ads. Want to tell Google you’re a REAL local business that’s an important part of their community? Get covered on your local news website. Better yet? Get an advertisement. Ninja tip: Don’t email them. Call them. They get a bajillion (a real number) of emails per day. When you call, you get their sales team on the phone. The fact that a prospect called THEM to give them cash means they’ll sell you whatever you want (generally). Tell them you’re a photographer and you want to online PR, but you’re not interested in their ‘traditional’ packages. It might be a few hundred bucks, but the boost your site gets means you’ll get 10 new clients to the tune of $35k, then wasn’t the $600 investment worth it? SEO for photographers is hard and it’s only getting harder. If you can pull off everything I’ve done in this post, you’ll have people beating down the door to work with you. But it takes a ton of time and things are always changing. For instance, this guide has been updated 4 times since it was first written (last updated: 7/8/18). A better option is to hire a pro for a few thousand bucks and get a 10x return on your investment. That’s what Shane did when he hired me and now he has an extra $42k in his pocket. SEO is the most important investment you can make in your photography business. If you’re going to do it, you know how to reach me. This post was composed on February 7, 2017 and most recently updated on April 14, 2019.